Well I bring a new script, the goal is that those users who use full screen, window mode or different PC's and are new or not so new in bem and can not configure a script or make it work, I hope this script can put it more easy and comfortable. 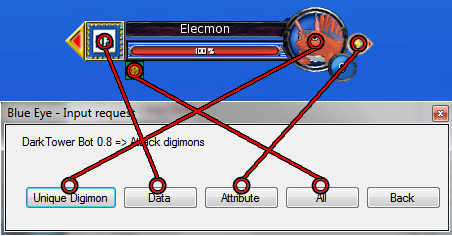 You simply have to select a digimon and press the desired button. Last edited by DarkTower on Sun Jan 21, 2018 5:12 pm, edited 2 times in total. Last edited by DarkTower on Tue Jan 02, 2018 10:47 am, edited 2 times in total. "If i said something important to you, please hit the THANKS button"
this is the best bot i finally have bem working and now i can bot easily thanks ! i only have one question is it possible to bot more than one digi ? for instance i'm farming koromon and when pumpkinmon (event) appears i kill him as well . any way for that ? loving it, but there's a way to put an anti-macro protector in this?